Thank you to all speakers, poster presenters, and participants! 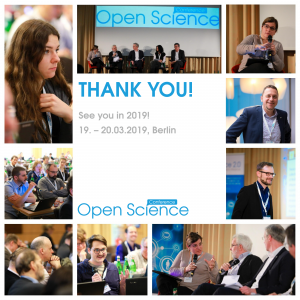 Save the date and see you again at Open Science Conference 2019 in Berlin. Invited as well as carefully selected talks, hands-on reports and a panel discussion will cover both the view of research data infrastructures and the view of the scientific communities. We also accepted 21 submissions (list of accepted submissions) to the Call for Project Presentation to be presented at the conference. The International Open Science Conference is organised by the ZBW – Leibniz Information Centre for Economics and the Leibniz Research Alliance Science 2.0.